She released her acclaimed debut album 32 years ago at the age of 21, but Akiko Yano still refuses to rest on her laurels. Even with a 27th solo album on the way, the pianist, vocalist, lyricist and composer is still searching for new musical experiences. Known mainly for her unique, versatile voice on her renditions of jazz and pop tunes, Yano has been collaborating with Kyoto-based electronic artist and producer Rei Harakami (see side bar) for the last four years in a duo called Yanokami. She first encountered Harakami in 2002. “There’s a Japanese band called Quruli and they have a single arranged by him called ‘Bara no Hana,’ ” Yano says during a brief trip to Tokyo following a Yanokami performance in Singapore. “When I listened to it, I was blown away. So new. Very organic. It was something that I’d never heard of. After hearing that track, Yano wanted to work with Harakami, so she got in contact. “I had the chance to talk to him and the next thing I did, I said, ‘Hey, let’s play music together.’ And he couldn’t say no,” she says with a laugh, feigning effusive charm. The pair worked together on two tracks for Yano’s 2004 album “Honto no Kimochi.” These two tracks, “Night Train Home” and “Too Good to be True,” both appear, as new versions, on Yanokami’s self-titled debut album, released last August. And in March, an English-language version of the album, called “Yanokamick,” was released, featuring two new tracks. The Yanokami albums consist mainly of Yano’s original works with Harakami’s electronic orchestrations and programming complementing her piano and vocals. “Originally, we started the Yanokami project with English vocals. The release of the Japanese version, I didn’t intend to do that, but maybe the record company wanted it,” Yano laughs. Yano says she has no preference for singing in Japanese or English. In person, Yano is straightforward yet cheerful, choosing her words carefully but quick to let out a laugh, even about herself. “I was a kind of ugly duckling,” she says with a big laugh as she recalls her childhood piano studies. Yano has played piano since she was 3, but did not attend a formal music school. She did not play standards and she sang in Japanese, unlike many of her contemporaries. Yano did not sound like anybody before her, her voice blending elements of kabuki, enka, jazz, pop and her own nasal touch. “I don’t have any specific person I really admired or idolized when I started out,” she says. “Music was my inspiration. ‘Japanese Girl’ was influenced by Japanese traditional music,” such as kayokyoku (Showa Era pop) and minyo (folk songs). After the success of her debut, Yano played and toured from 1979 till 1980 with Japanese electropop group Yellow Magic Orchestra, where she met Ryuichi Sakamoto, her second ex-husband. She continued making her own albums, but the YMO experience was valuable to her. “If you had one thing, just one little thing, and you had to grasp it for all your life, it would be impossible to create (music) for this long,” she says. In 1990, Yano, Sakamoto and their daughter Miu moved to New York, where she still lives. Yano has released three albums in the United States, but her fan base is largely in Japan. 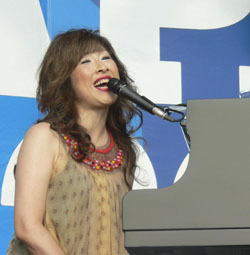 She comes back almost every year for a weeklong, sold-out stint at Blue Note Tokyo. 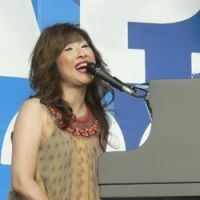 Yano’s influence is not lost on young musicians, such as fellow transplanted New Yorker Hiromi Uehara. The 29-year- old jazz pianist played on Yano’s most recent solo album, 2006’s “Hajimete no Yano Akiko.” When we spoke last August, Uehara cited Yano as an inspiration. Yano’s voice has been compared by critics to artists such as idiosyncratic British pop icon Kate Bush, eclectic singer-songwriter Yumi Matsutoya (known for her lavish concerts as Yuming) or eccentric U.S. musician Tori Amos. She admits that her voice does tend to draw attention away from her agile piano skills. Though already a successful artist, Yano continues to challenge and reinvent herself. She does this perhaps because her goal in life is a difficult one to attain. Rei Harakami breaks into a self-effacing laugh during an interview in Tokyo when describing his live performances. Harakami chuckles he would be willing to make another Yanokami album “if people want to listen.” However, when talking about his solo electronic music, Harakami’s laughter gives way to serious thought. His sound is impossible to explain, he says, since there are no spoken words. Yano, meanwhile, has high praise for her experience of making music with Harakami.